Imagine this! A global company which does business on almost all parts of the world supplying to the large oil and gas companies, top 5 largest FPSO valued for less than RM1 billion or USD250 million that is. One can say that it is now largely in debt (about RM11 billion) and huge portion of it is in short term debt hence its liquidity is an issue. With that we can probably put a discount because of the risks but those that fear over it defaulting in its debt probably is worrying too much. Bumi Armada, as we know is controlled by one of the richest man in South East Asia, Ananda Krishnan and in himself, there is a certain level of ethics which he has shown and practiced towards the investment community in the past few decades from what we know. We know that he has taken some companies private before and put them back again in the public. (All his major holdings Maxis, Astro, Bumi Armada have gone through that route) Through that route, which I was critical of them, he had actually not let many of his investors down as those holdings were profitably for most of the shareholders. This is unlike some of the companies that have gone private where the party who is privatising the shareholders have taken investors for a ride buying them way below intrinsic value. This time around Bumi Armada has gone into a little bit of trouble largely due to the poor oil price since 2015. Bumi Armada has two main core, the first which is OSV or Offshore Service Vessel and the other FPSO which stands for Floating Production Service Offloading. Because of the poor oil price, OSV has largely been impacted and because the OSV's business has less barrier of entry, it is hugely competitive in times where activities on exploration, offshore production is kept low. Many companies in the OSV space are not able to be kept afloat. 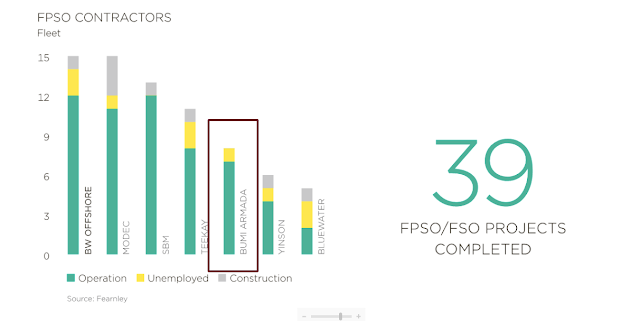 FPSO on other hand is a more complex business. It is a partner to the oil companies which is extracting out the commodity from the sea. There are not that many companies which are capable of getting into this business. As mentioned above, Bumi Armada is one of the largest. Yinson from Malaysia is the other. Bumi Armada as we see it is less preferred than Yinson - mainly because of its balance sheet, not its capability. Yinson in fact, is a lesser size player. 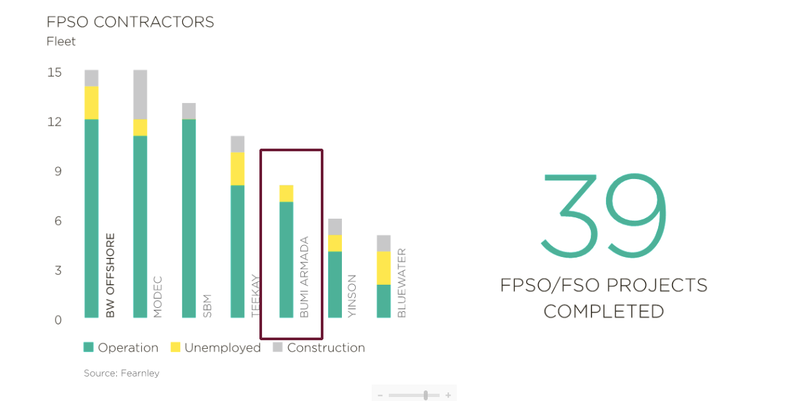 FPSO is not a dying business and it has much less competitors. When as outside investors see that the company is in liquidity crunch, the two things that comes in mind is additional injection - which means more capital and the other being liquidation which is the worst of the two. Either one however, during times like this is less preferable. Bumi Armada has come out on record to say that it is not looking at raising funds through additional injection. Coming from them, I would say I trust what they are doing. Instead, it is looking at restructuring its short term debt - which is still a problem - and trying to renegotiate the rates. The CEO of Armada, in its letter to its employees, has written and advice to keep the level of new business development low as they are going to restructure the loans. From this perspective, I take it that it is trying to be careful rather than being in serious condition until it defaults. Why do I say this? As a start, the level of business operations activities for Armada for the last 1 year is at its highest for the last 5 years. It has just gotten acceptances for 2 of its largest FPSO projects through Armada Kraken and Armada Olombendo. These are the 2 projects which are more complex than its earlier projects - and the key is that it has gotten acceptances, where from here the contractual work should be more smooth flowing. All in all, Armada has over RM20 billion of contracts in hand and another RM10 billion of extension options. I would also like to highlight that the high gearing over the last few years is also because of mainly the 2 large projects. From 2014 to 2017 as shown below, it has been investing into these business. What Armada has gotten into trouble is from the OSV business and the termination (Armada Claire) and bankruptcy of one of its client in Nigeria. These largely caused them to be sunk into some liquidity issue. I do not think these are issues which cannot be solved especially given that it has solved the larger operational issue from Armada Kraken. Looking forward, I would like to think that despite oil price being lower than the best years between 2012 - 2014, many of the oil producing countries have gotten hold of the shock better than what they experienced in 2015. Oil price may not go as high as USD90 or USD100 anymore as it is now having shale as a competitor but they are better prepared. In analysing Bumi Armada, it is not easy as it is going into chartering and there are different degree of complexities in its business. One of the better explained analysis is coming from CIMB here (page 52 to 57). Its analysis is extensive and I think it looks at it objectively especially on individual projects. Today, we hear that it is keeping its call unchanged. I feel it is right as to me fundamentally it has not changed much. What the analyst as usual has not taken into account yet is the strength of the brand, relationship, customer exposure, processes that the company has built over the years. With that, it should be worth more. I do not think the risk of defaulting is high. It may face high interest costs but it should also not be worth just around RM1 billion for a company this level.